Sleep comfortably with a LUCID® Comfort Collection plush, medium, or firm 10-Inch SureCool Gel Memory Foam Mattress. Choose from our three different profiles to tailor your comfort to your personal sleep style. Each mattress consists of a 7-inch layer of high-density support foam and is topped with a 3-inch layer of SureCool gel-infused memory foam. PureFlow ventilated memory foam conforms to your curves for an individualized sleep experience and SureCool gel infusions capture and distribute heat to regulate temperature. She absolutely LOVES this Gel-Infused Memory Foam Mattress! She has told me that she sleeps SO MUCH BETTER NOW!! Very fast delivery and very good quality product. Great job, Lucid. Everything was as described. I did not expect it to arrive within days of purchase. I live on the second floor of a condo building and the delivery person brought it all the way to the second floor main entrance. I wasn't home, or I'm sure they would have brought it inside for me. I opened the mattress right on my bed. It instantly began to reshape and within 8 hours I was sleeping on it. Instructions said to wait 48 hours, but at that point it already opened to 9 out of the promised 10 inches and I was anxious to try it. There is a mention of 'slight odor' in the description. I didn't smell it, but I left the window opened in the room after opening the box. As for my actual experience with memory foam vs a coil mattress, I've never slept on a memory foam mattress before and as a first time user it felt a little weird after my ultra soft pillow-top spring-coil mattress. Not a bad feeling, just an odd feeling that a mattress doesn't 'bounce', instead it 'molds' to your body. This one was listed as firm to plush, which is a lot firmer than the pillow top I was used to, and for a moment I was disappointed with the firmness. However, I've slept on it for three nights now and while it's certainly not pillow-top soft, and 'plush' turned out to be more firm than I expected, I still sleep very well on it. The gel technology seems to work well also. It's winter in Ohio right now, but it does seem to have a 'coolness' to it. In the end, I came back to the site and just placed another order for the exact same mattress for my parents. It was on sale this time and $30 cheaper. Bonus. As for my experience with memory foam vs spring, I think I will be buying memory foam in the future instead of spring again, but I would go ultra plush next time because I like very soft beds. I was worried about ordering a mattress online. Never done it. Reviews were a mix of good and bad, people either loving or hating it. I decided to take the risk bc the deal was too good to pass up and I am so happy with my purchase! Shipped great, came a day earlier then expected. Rolled out like a fruit roll up perfectly onto my platform bed frame. Expanded to the full 10 inches in 6 hours. And I just woke up from sleeping on it for the first time and it felt like a dream! This one was medium plush and it was a great decision, I like softer beds. However they also have a medium firm one, I would suggest that if u want a bit of a tougher one. All in all it’s was definitely worth the money! Such a great deal. Material doesn't get too hot or cold and feels high quality. Firm but gives for comfort. Highly recommend this LUCID 10-inch Queen-size Plush Gel Memory Foam Antimicrobial Mattress. 1. Packaging is well thought ought, very compact. Shipping box is easy to maneuver into place. 2. Easy opening and set up. The mattress comes in a vacuum-sealed plastic bag. The instructions were simple as was the opening of the bag. Just be careful not to damage the mattress. They enclose a “letter opener” type device to assist in the vacuum-sealed package opening. We found it simple to open and get laid out on our Queen box springs. 3. Very little odor, which dissipated very quickly. The smell was never objectionable like I have had on foam mattress toppers in the past. This mattress takes 24 hours or so to fully expand. 4. I was thrilled with how comfortable it was! It seemed too firm to start with and I thought I would have trouble sleeping, but I was surprised how well we slept and will now spend much more time sleeping in the guest room!! My husband is a pilot and spends 10-15 nights a month sleeping in different hotel beds. He said he wishes he could take this mattress with him for a GREAT nights sleep every night he is away. I wish i had gotten the 14 inch high mattresses. Much more firm than what I’m use to . I bought a 4-inch gel memory foam pad to put on top for added softness and height and it’s great. Ordering a bed for my mom for mother’s day. Very comfortable! Definitely more of a firm mattress, but that's exactly what we like. The 10 inch is thick enough! Seriously have had the best night's sleep since receiving this! Steal of a deal! This is the second memory foam mattress I have purchased. It performs well, so comfortable to fall asleep on. Delivered to your house and easy to open, My husband and I been sleeping like a baby. It's really comfortable and well made. We definitely will buying another one. So comfy! So easy! So impressed! Purchased for my daughter's room. Very pleasantly surprised with quality and comfort. OMG I love this mattress!! Its comfortable like sleeping on a cloud and still firm at the same time. Do recommend it to everyone.. Happy overstock buyer!! Have had this mattress for about 3 weeks and we love it. Very soft but also firm and supportive. You cannot beat this for the price and comfort. Platform mattress at its best! This platform mattress is thick enough to offer wonderful comfort but remains cool throughout the night. It is definitely a good deal for the price! This bed is super comfortable! I have had great sleep from the first day that I got it. This is the best money I have every spent. No smell. Just open it and allow to fill out over several hours. My back issues have disappeared. Medium is more medium-firm. I had never owned a foam mattress and was a little reserved about purchasing one. My neighbor helped me unpack and place on my boxspring, it started to rise immediately. Waited about an hour and it already measure the 10" described. When I layed on it I was overwhelmed with relief, so comfortable and, more inportantly, the firmness I need for my bad back. Great product! I loved that the mattress was delivered on time!! The smell is a little much...but some febreeze and a few days of being open I believe will help. A little more firm than I would have liked, but much better than our lumpy old one! Have only slept on the bed 3 nights. So far so good. This mattress arrived quickly. Followed directions on taking it out of box and setting it up. Within a week we noticed that the mattress was already sagging on both sides. We felt like we were falling out of bed. Called OVERSTOCK and they quickly took care of the problem. Thanks. Overstock. This is a great mattress for the price. It's comfortable and doesn't require a box spring. Highly recommend! so comfortable and such a good price. Bought this to go on the murphy bed also bought from Overstock and it works super well! It's a very impressive mattress with a beautiful cover but not soft as sold. Nowhere near as plush as my old four inch foam topper, I woke up with shoulder pains and did not get a deep sleep. The box and mattress do not say plush anywhere, so I'm guessing it's a marketing ploy. If you want firm, this is a beautiful mattress. "Why do the 10" thick mattresses have a Queen width dimension of 59" when standard is 60" wide. Specifically on this mattress, the width measurement is different in the Details list from the Specs list. It makes standard sheets fit funny. Are there manufacturer Specs available?" "Does this come with a washable mattress pad?" You would want to get your own personal mattress pad, as with a regular mattress. The mattress comes with a zippered cover BUT you would still want to buy a seperate cover. Heaven forbid if you washed the cover it came with then couldn’t get it back on. "How much does this mattress weigh? We want this for a travel trailer. Weight is important! Thanks!" This mattress weighs 67 pounds. Weighs less than a traditional pillow top mattress. I think you would be ok putting on you RV/travel trailer. You might would want to consider the 8” over the 10” in my opinion. "Hi is this a cooling mattress? " 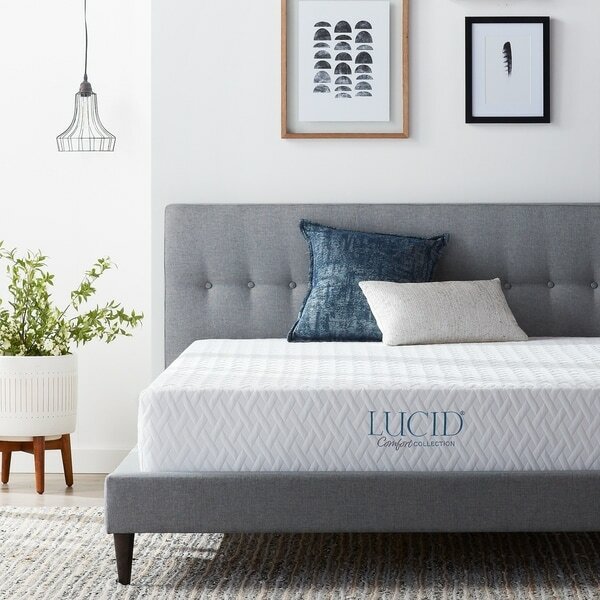 The LUCID Comfort Collection 10-inch Queen-size Plush Gel Memory Foam Mattress is not a cooling mattress, but has gel infused memory foam that regulates temperature while conforming to the body to ease pressure points. I have not had any issues with getting too hot and sweating while sleeping on it. "Hi. what can i put on this mattress to make it higher/? A topper or Box Spring?" You could use a topper. Depending on the bed you have you could also use a box spring. "Does this mattress require a box spring?" No this mattress does not require a box spring. "I want to buy this to take as checked baggage on a plane. 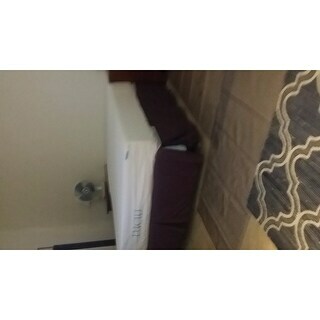 The mattresses where I have a condo are very expensive and not very high quality. I would like to know the dimensions of this mattress when it is compressed for shipment." Boxed dimensions for this mattress are: 62 X 15 X 15. If you have additional questions about this or any of our products, contact us. We are glad to help. Thank you! Lucid. Beds for the Whole Family.